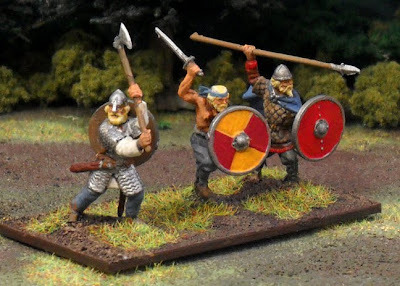 One of my current armies in progress is a 1/72 Saxon army for DBA. 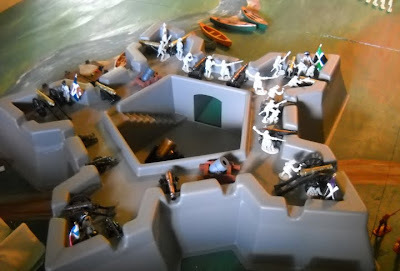 I thought the horde element would look really cool, so I bought a box of Zvezda's Peasant Army (see sprue scan). 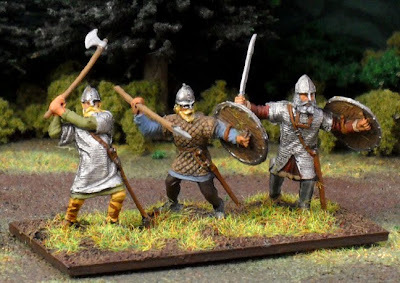 These guys are meant to be a 9th century Saxon fyrd. The cows in the background come from Imex's American Pioneer box. That set also has some nice pigs, which I have yet to paint. The paper buildings come from an excellent series of 1/72 scale Dark Age and Medieval building kit books. These particular buildings come from Usborne's Viking Settlement. 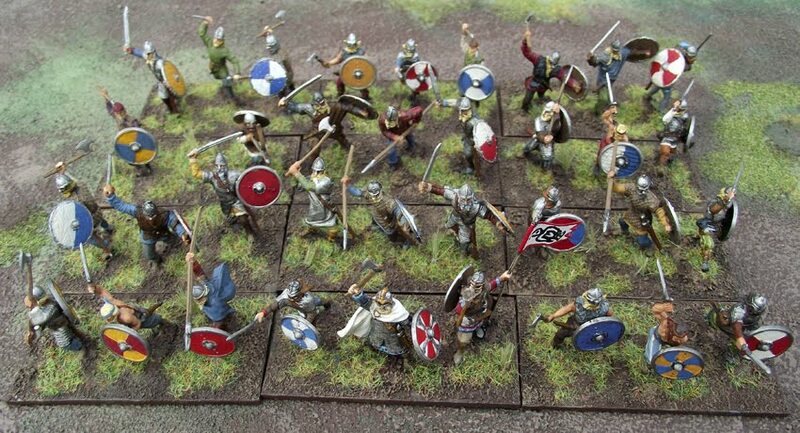 Several years ago I came across fan-made army lists for the tabletop wargame De Bellis Antiquitatis. 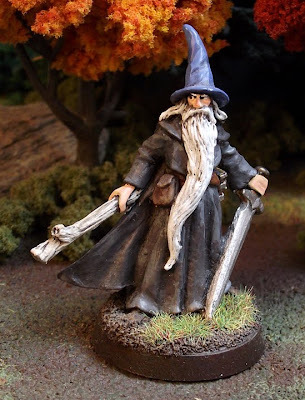 On his site David Kuijt hosts eleven Lord of the Rings DBA armies. For me DBA is all about 1/72 scale. 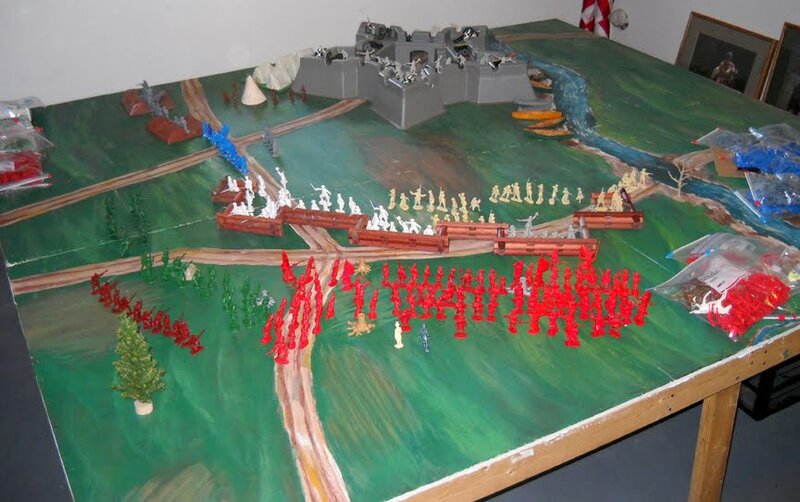 At the time I found his site there weren't any fantasy models in that scale. Now there are a several sets to choose from. 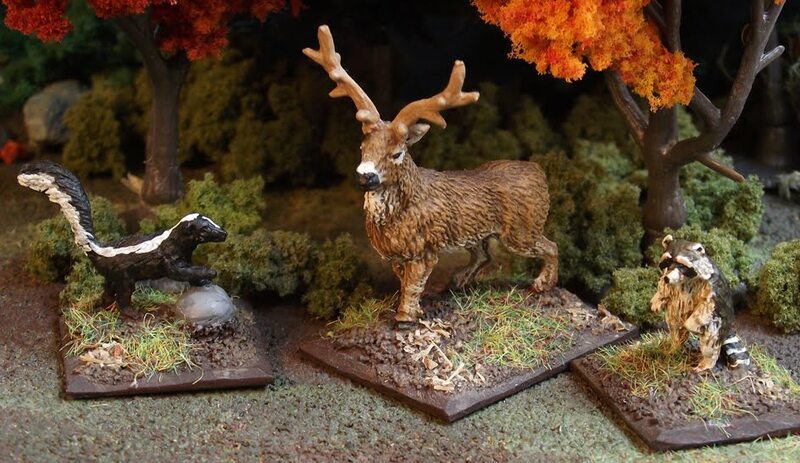 The above photo shows the models that will appear on the Wb general element of my Misty Mountains army. I want as much variety in models as I can, so I am using a mix of Caesar orcs and goblins, Zvezda Medieval peasants (the grey plastic), Strelets Franks (the copper color plastic), and Rebel Minis Bag o' Orcs (the metal guy). 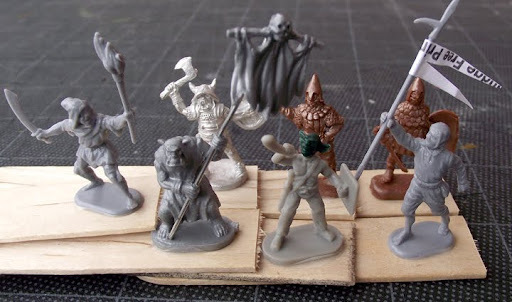 Some of the human models are getting head swaps (see the horn-blower above), while the beardless ones will simply be painted with green skin. The Strelets models are perfect because the sculpts are pretty gnarly and they have unusual armor. The white paper flag is made from a piece of an adhesive mailing label. The Misty Mountain army is meant to be just made up of goblins (no big orcs). However, I am using this list as a mixed orc/goblin army. Usually I'm the one offering book reviews, but today I am happy to share a review of my recent book that appeared in the January 2011 issue of WWII History magazine, p78-79. "People often forget that it takes 10 men in the rear areas to support one infantryman on the front line. 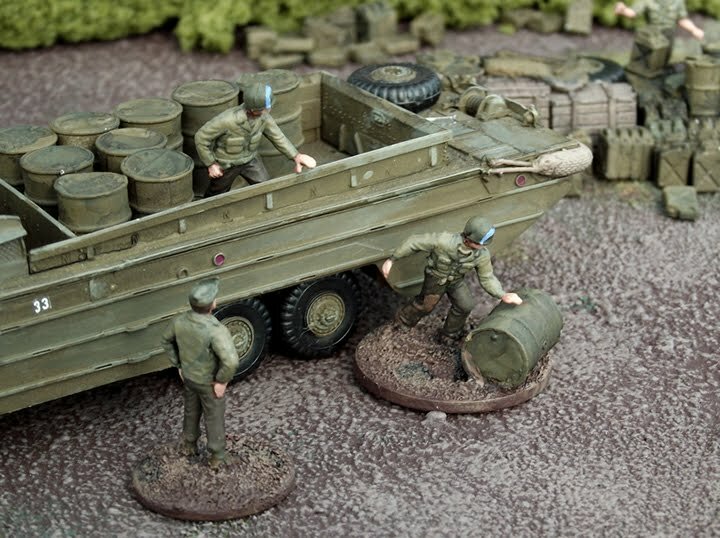 However, for the men of the port battalions, there were no front lines on June 6, 1944, and at times, they found themselves under heavy fire as well. 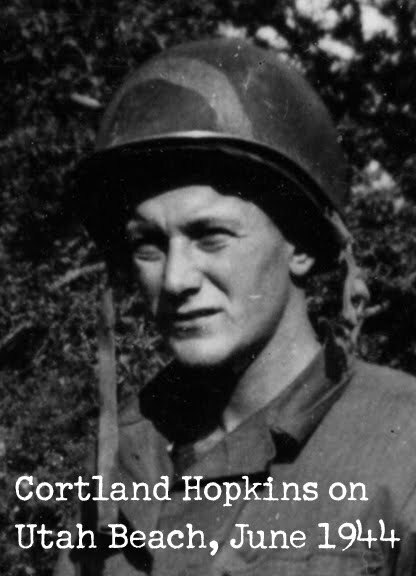 The author is the grandson of one such soldier, Cortland "Corty" Hopkins, from Schenectady, New York. Hopkins had a difficult time getting into the service because his job was considered essential by the War Department. However, after many attempts, he was successfully inducted into the Army in 1943. Brozyna does a good job in describing the duties and experiences of his grandfather's unit during the D-Day landings, the fighting in Belgium, and the Ardennes Offensive. Without a doubt, the port battalions made numerous contributions in supporting the soldiers in the field." If you are interested in learning more, please visit my book blog LonshoreSoldiers.com. I regularly post new articles and photographs relating to WWII supply work and wartime Normandy, Antwerp, England, and Schenectady, NY. I'm keenly interested in ancient and Medieval daily life. Last month I grabbed a bunch of books to read my daughters for bedtime. 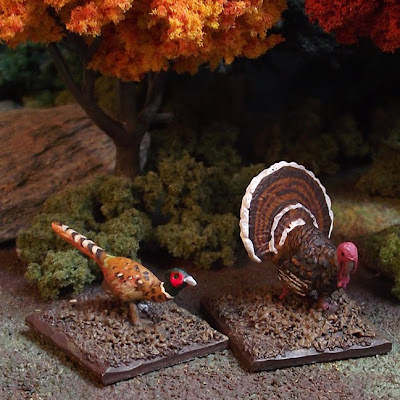 I thought I'd share them here as they make excellent references for dioramas, tabletop wargame scenarios, or rpg settings. 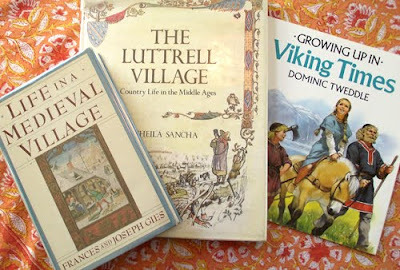 Life in a Medieval Village is a classic on the subject. It's a scholarly, yet approachable text discussing the lives of the lord, clergy, and all the various peasants found in a feudal English village. The Luttrel Village by Sheila Sancha is meant for children, but is equally illuminating for adults. In the 14th century the lord of an English village, Geoffrey Luttrell, commissioned an illustrated prayer book, now known as the Luttrell Psalter. 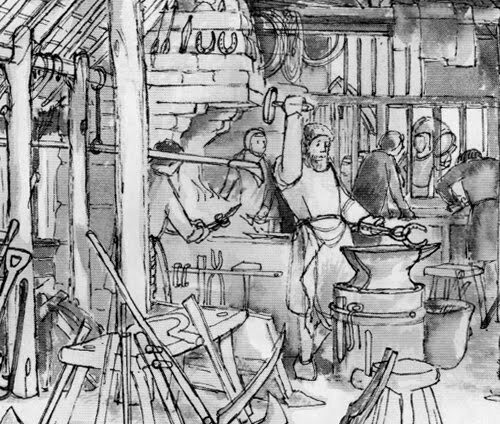 It offers a rare visual depiction of ordinary Medieval people. The author studied the psalter's images, the village site's modern landscape, and referenced current (as of the 1980s) archaeology. She combined these sources into her own artwork and text. 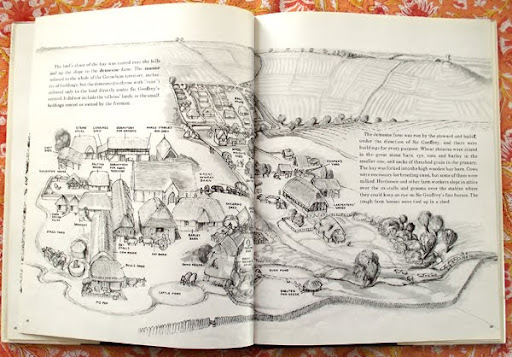 There are 64 pages of greyscale maps and illustrated scenes of the annual work and life in the village called Gerneham in Lincolnshire. 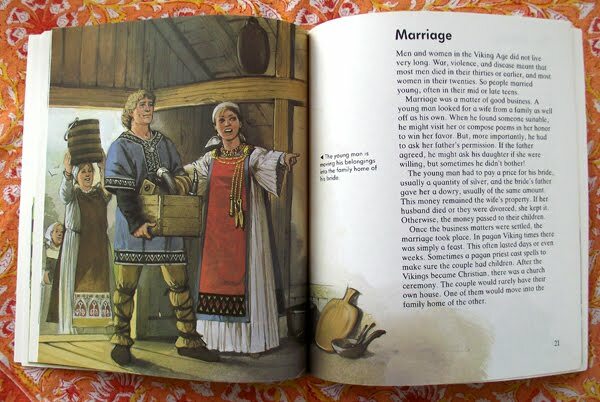 Growing up in Viking Times was a happy discovery. The text is maybe at an 8-yr-old reading level, but the illustrations are by the esteemed military history illustrator Angus McBride. So, the book is basically eye-candy. There are 32 pages of color viking scenes: exploring, farming, and trading. I've got a bunch of 28mm villager minis painted up along with 28mm animals. Right now I'm working on Zvezda's 1/72 Medieval Peasant Army models (see sprue scan). I'm using them to build a 9th century Saxon fyrd, but a few poses could be used as villagers at work on the farm. 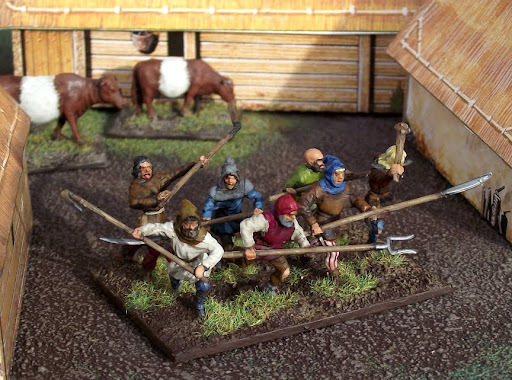 If you're in need of 1/72 livestock, check out this sprue scan of Pegasus Farm Animals. "I didn't mind moving the ammo. It was the gas that worried me I didn't want to burn to death [if a Germans hit the DUKW]" —Cortland Hopkins, p 79 in Longshore Soldiers. The helmet markings worn by the port battalion troops are especially interesting. For the D-Day invasion my grandfather's unit was attached to the 1st Engineer Special Brigade. All attached troops received a blue arc. 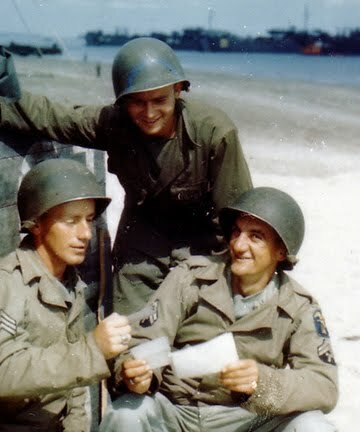 Below is a color photo of some 1st ESB men on Utah Beach in 1944. Port battalion helmets on Omah Beach received the marking of the 5th and 6th Engineer Special Brigades. There's was a white arc with a blue & yellow amphibious training command insignia underneath. This insignia is visible as a shoulder patch in the photo below. 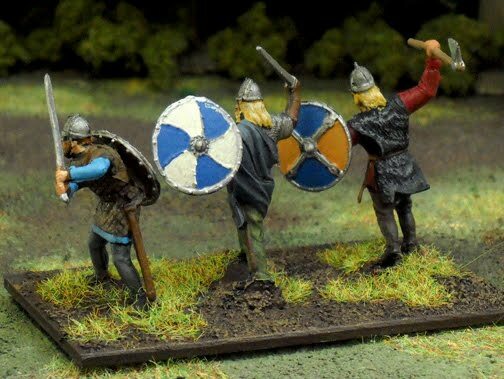 Pictured above are freshly-painted Emhar/Imex vikings on a Bd stand. 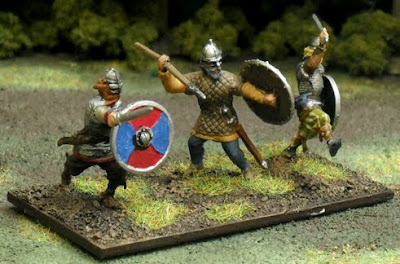 With these large figures you can see why I opted for only 3 models per base, rather than 4. Below are two more blade elements using the Zvezda vikings. I'm glad these photos came out a little better than the last round. I should invest in some nice Silfor Tufts. The static grass has been getting everywhere! I'm halfway through painting a DBA viking army, III/40a. It's made up of 1/72 plastic figures by Zvezda and Emhar/Imex. This general element is all Zvezda models. 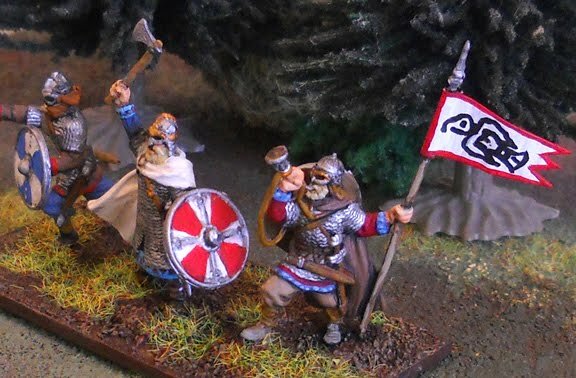 The Emhar vikings are tiny bit larger that Zvezda, so for he most part I did not mix the two manufacturers on the same element. I wasn't too happy with the molded plastic flag that the above standard bearer came with, so I fashioned my own paper banner. The raven design comes from a viking coin. The official rules call for 4 models on a 20mm deep base, but I am implementing house rules. All my bases are 30mm deep with only 3 models, similar to the way Tim builds his DBA elements. The base frontage remains the standard 60mm. I expect the full army will be painted and posted within the next week. Six elements are done, with six left to go. When finished I'll paint up an opposing 9th century Saxon army (made of Emhar/Imex models). I'm most looking forward to painting the horde element, a Saxon fyrd which will be composed of Zvezda Medieval peasant models. 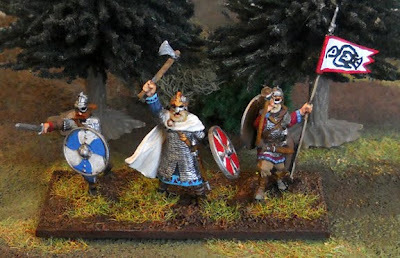 I think I might also field these vikings against Vinland Indians, the IV/9 Eastern Forest American army. I suppose I have enough pre-Columbian Native American models in 1/72. 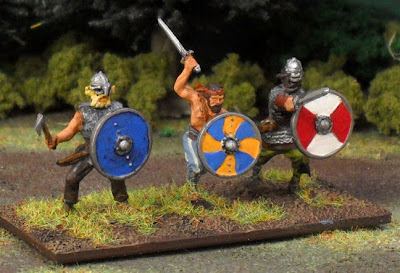 I have Imex's Eastern Friendly Indians, but as the set's name suggests there are few combat poses. I own a box of Imex's Sioux Indians, which has a few bow/club/knife men. The 19th century Plains costume isn't quite right, but one must make do with what one has. 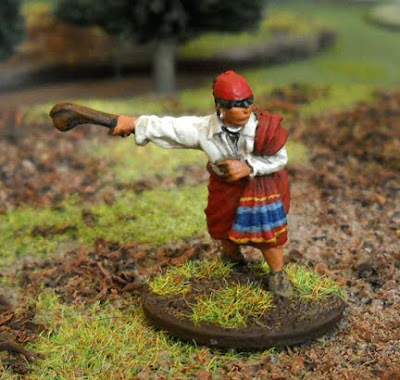 I recently bought Italeri's Indian Warriors, but most models carry a musket. Maybe combining these three manufacturers will create enough variety of poses. 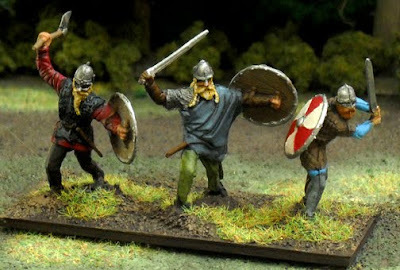 And, of course, I will be building a orc/goblin army with 1/72 fantasy models by Caesar. So, after 5 months of inactivity I finally painted something. In August I finished my WWII book, so now I can use my spare time to for my hobby. 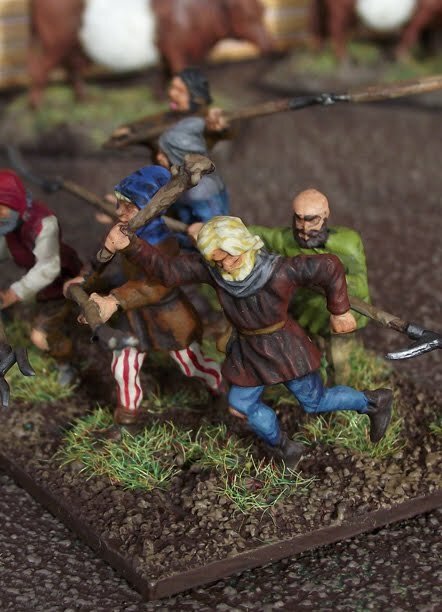 Picrured above is King Philip from Brigade Games King Philip's War range. This is a really nice set. The flared musket barrels (almost a blunderbuss) mark these as 17th century Indians, but they would work well for 18th century warriors. These five models here are from Indians set 1. The war paint and beaded strap & bag offer an opportunity for some eye-catching paint work. For reference I used American Colonial Ranger by Gary Zaboly and a brochure of Robert Griffing's paintings, which I snagged from a gallery in Gettysburg, PA.
See my painted Pilgrim set 1 from last October. Airfix Kits is a sharp little book about the venerable British model kit company. It's a brisk 56 pages with oodles of color photographs. 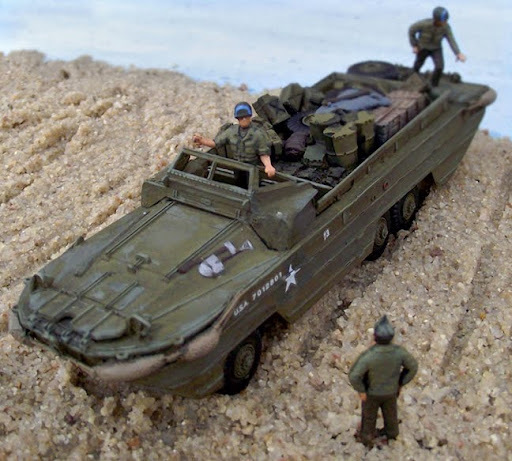 Written with experience and humor, it's apparent that the author is a long-time modeler. The book traces the hobby's history back to the first crude kits in the 1930s and brings the reader to the Airfix company in 2009. Pask writes about production technology, marketing, box art, logo & packaging, and Airifx's context within the broader model kit business. 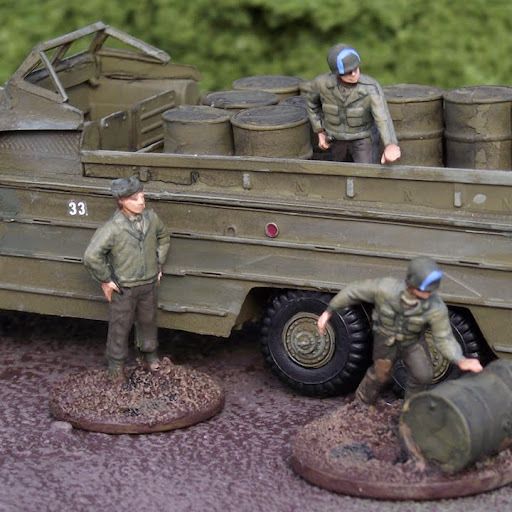 The most important and innovative models are picked out to chart milestones Airfix's history. 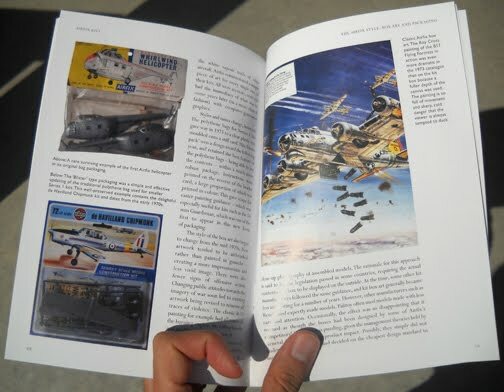 An overview of Airifx's many other kits appear through the book's seventy color photos and captions. There are more voluminous and focused Airfix books in print (these are referenced in the bibliography), but Shire Books' Airfix Kits fills a niche. Readable in one sitting, it's a concise history at a low price—an ideal book for the hobbyist wishing to save time and money for that next model kit. P.S. 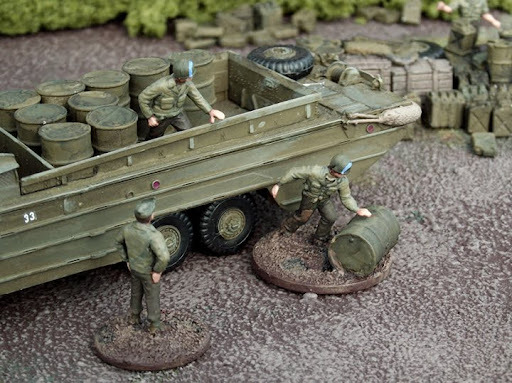 Histoire & Collections is released the English version of Les Petits Soldats Airfix, by Jean-Christophe Carbonel. The Airfix Little Soldiers was a limited edition and is now sold out. Hopefully there will be a new edition soon. Traditionally the West's dominant view of Mithradates came from his Roman enemies, and in recent times there has been virtually no view of the forgotten king. Adrienne Mayor does history a great service by countering that imbalanced knowledge. In The Poison King Mayor strips the skewed Roman accounts to present a story closer to the truth. Her story is supported with alternate contemporary sources and modern archaeology. As a result, the reader views Pontus' royal family and Rome's Mithridatic Wars from the probable perspective of the king. Mithradates' intelligence and personality shine through Adrienne Mayor's text. Her writing is highly engaging, appropriate for such a dynamic character. Regrettably several descriptions of military equipment were in error. Roman swords were not at all like machetes, as the author described them. 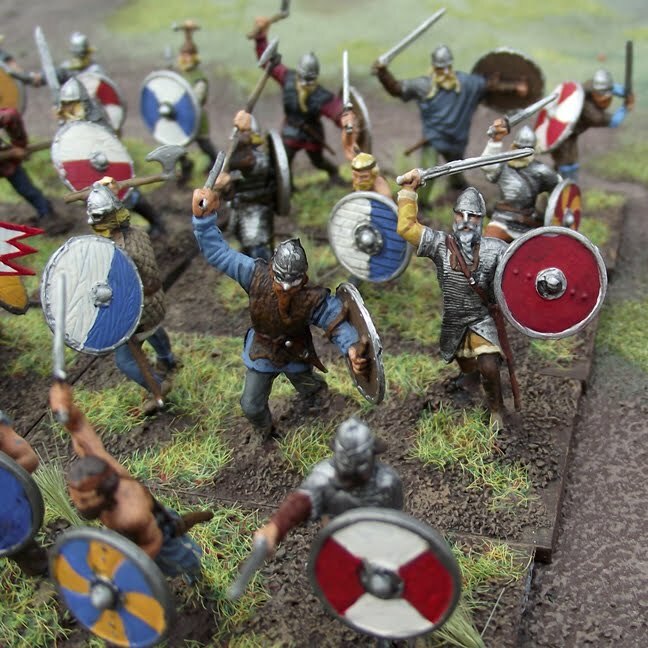 Armenian and Parthian Cataphracti were more typically armored in lamellar or scale, not chain mail. As annoying as these mistakes are to someone knowledgeable of ancient arms and armor, they have little bearing on the thrust of this book. Mayor intends to convey the general events of Mithradates' battles and their effects on his life. Although I would love to read a detailed description of his troops' armor, weapons, unit types, training, tactics, etc., this specialized subject is outside the scope of The Poison King. P.S. For a military account of Mithradates' reign I plan on reading Mithradates The Great, by Philip Matyszak. P.P.S. And what a brilliant book jacket design! You have to see it in person. I love the shimmering metallic ink, the coin's embossed hair is a great effect, and the overall classical imagery contrasted with modern typography is appealing. The book was a finalist for the National Book Award. That's lovely for the author, but the large ugly seal on the cover is an unfortunate distraction. When we visited last year we weren't able to see his war table, because it was covered in boxes from his recent move. Now it's all set up for display and fun. Dad's favorite genres are the French and Indian War, American War of Independence, Napoleon's wars, and the American Civil War. He has boxes upon boxes of plastic soldiers, but right now his table is covered with a FIW display. 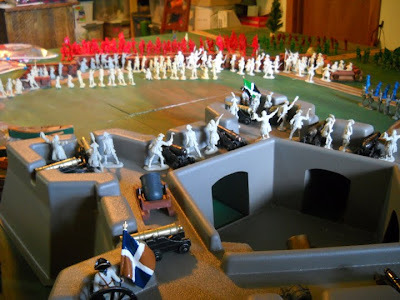 He says he games with unpainted plastic, because the paint would chip off the painted models. I've been trying to introduce him to acrylic varnish (It has a little bendy-ness to it, which is good for plastic). Above are Montcalm's forces defending Fort Ticonderoga. His fort is vacuform plastic. 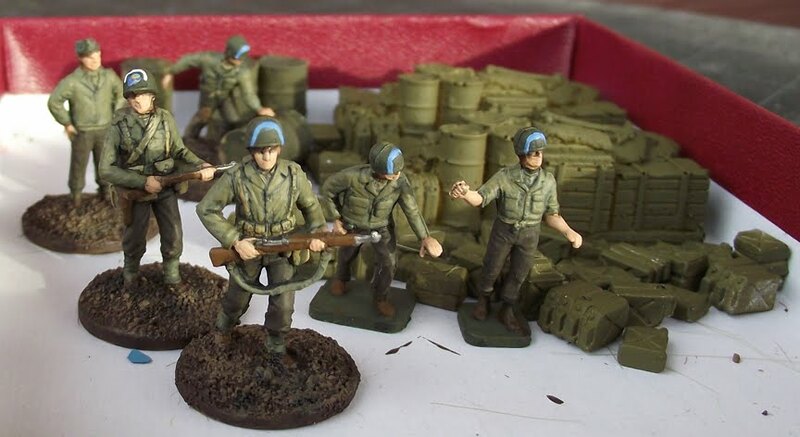 The figures are a mix of Armies in Plastic's new 7 Years War figs, Marx reissues, Accurate, and Barzso. His table is two 4 x 9 ft. custom built tables pushed together. They are topped with painted plywood. His old table in Pennsylvania was a sprawling six table wide. He had to leave behind a few when he moved to a place with a smaller basement. This current FIW display is appropriate, because he lives 10 miles from Fort William Henry, and an hour from Fort Ticonderoga. 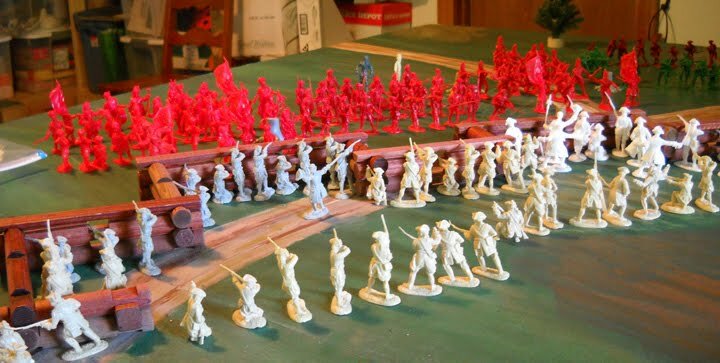 Here are some of his painted soldiers. He goes for the classic glossy enamel look. Above are: 1.) Black Watch, Regiment of Foot Highlanders (pre 1758). 54mm Barzso; 2.) 48th Regiment of Foot. 54mm Barzso; 3.) 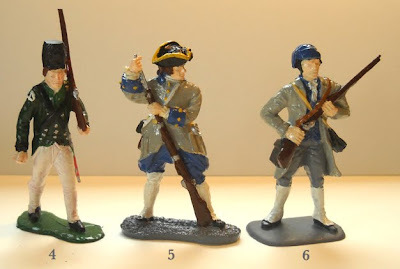 Virginia militia, French & Indian War. 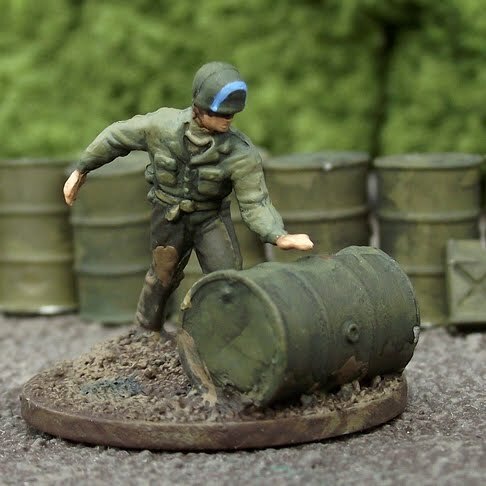 54mm Barzso. Above are: 4.) 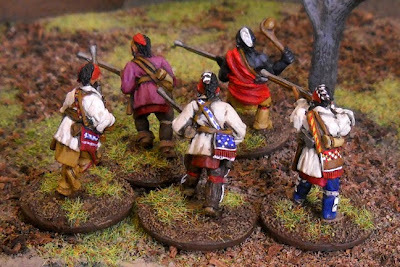 Queen's Rangers, American War of Independence, 54mm Marx reissue (he cropped off the top of the fur cap to make a ranger cap; 5.) Montcalm's 37th Royal-Roussillon regiment, 54mm Barzso; 6.) 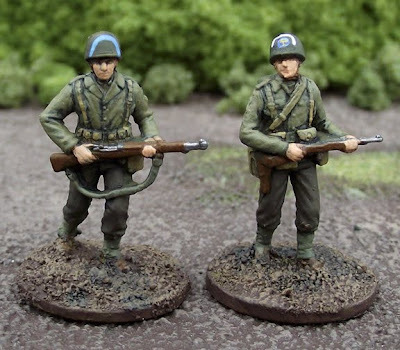 French Troupe de la Marine, 54mm Accurate. 519th Port Bn in WWII: Longshore Soldiers released! 519th Port Bn in WWII: Longshore Soldiers released! : "Yesterday I gave final approval for the book. It was great to finally see the work in print. 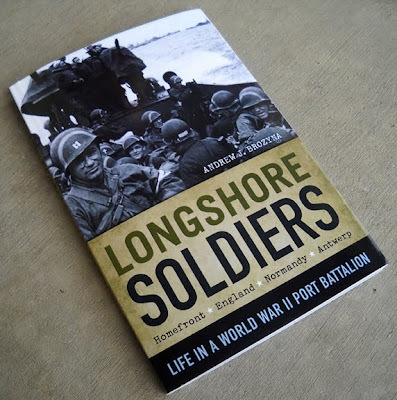 I'm waiting for my fist box to arrive, but the ..."
On my book-writing blog I posted an excerpt from my book, Longshore Soldiers. 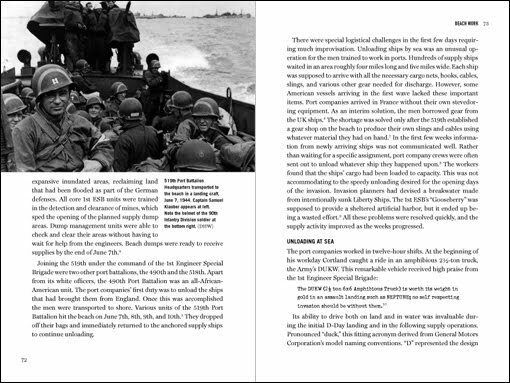 It's my grandfather's story of his D-Day experience on Utah Beach. In the news today is the story of another US Army port company veteran. Attached to the 1st Engineer Special Brigade the 490th worked on Utah Beach alongside my grandfather's unit, the 519th. You can read his article here on the Chattanooga Times Free Press website. "And there wasn't no segregation there on the beach that day. There wasn't any segregation at all. It made ya think. It made you think a lot. We're here, we're all serving together, and we're all getting along together today. Why couldn't this happen tomorrow and the next day, ya know?" My kids and I spent another couple hours playing with Legos today. We tried to follow the directions for a castle, but I couldn't find all the pieces. 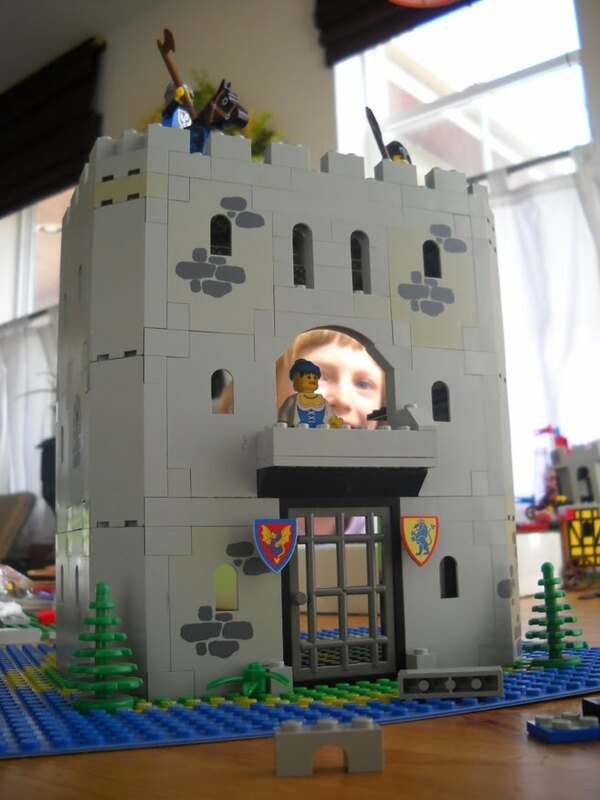 So, I scratch-built this tower, while my kids put in a red floor in a half-built castle, worked on a little house (both in the background), and played with the minifigs. My daughters and I played with my old Legos today (Legos are "miniatures" right?). 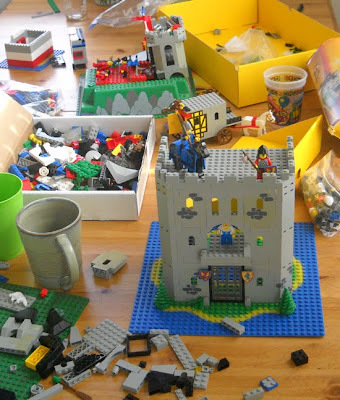 I've got boxes and boxes of the Castle Lego sets from the 1980s and 90s. 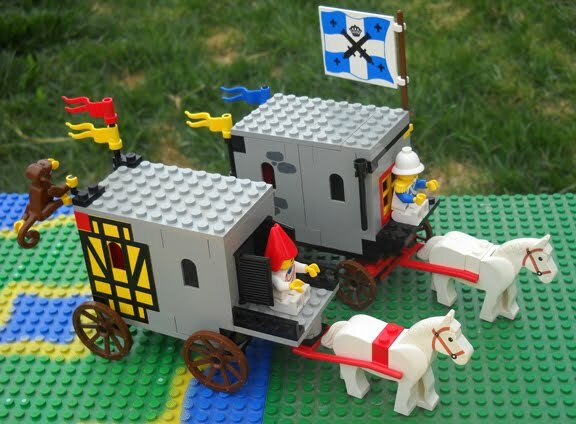 We made these two wagons with castle bits. I still have the Lego minifigs and instructions for the Black Monarch's Castle, King's Mountain Fortress, King's Castle, and the castle for the knights with the bird on their shields. 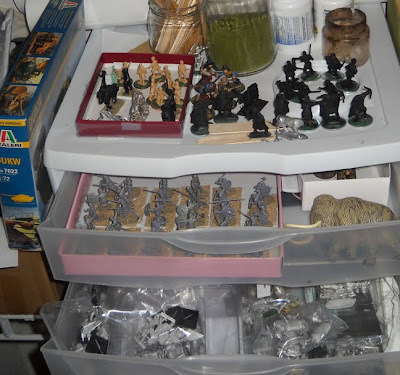 I'm sure I have all the pieces, but they're loose and mixed together in a couple different boxes. We'll have to see if we can sort them out and reconstruct at least one of these castles. Obviously I was way into knights when I was a kid. I still have the first 5 lego knights I was given in 1983 or so. I could photograph them if you're interested in seeing them. I remember a few years ago Lego was selling fantasy Medieval sets with dwarves, goblins, etc., but they have moved on to different subjects since then. I kinda wished I had bought a few of those fantasy sets. eBay has them of course, but the prices are jacked way up. 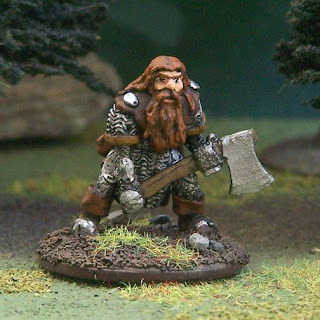 I'm not going to pay $5 to $15 for one dwarf minifig. It's been pretty quiet around here hobby-wise. I haven't painted anything in a very long while. Business was extremely busy last month, so I was working evenings and weekends. And when I wasn't working on client projects I've been spending my free time writing my history book. It's about my grandfather's WWII unit (check out the book blog). I have to say I have missed painting and posting these past few months. I have a closet full of guys just waiting. It's a real mix of genres. I have a 1/72 WWII paratroopers in there, a bunch of 28mm animals, 28mm prehistorics, 28mm King Philip's War Indians, a 1/72 DBA viking army (and opposing Saxons), 28mm fantasy models, 1/72 models for a 17th century New England colonists DBA army (and opposing woodland Indians), and I got a 1/72 DUKW model (my grandfather worked on those at Normandy). I already primed my scratch-built 28mm tavern model. I need to paint that and some villagers to go inside. My book is almost finished, so I'm looking forward to getting back to some painting soon. I think I'll get to work on those 1/72 WWII guys first. Hopefully all my paints won't have dried up by then. On a slight side-note, I've become intrigued with the board game, Agricola. Have any of you readers played it? I'm thinking of buying it to play with my wife and daughters. They're not too fond of tanks, guns, swords, etc., so the game's farming theme should appeal to them.